A well trained Search & Rescue dog is a sight to behold. The dog can evenly manoeuvre the most difficult of terrain with the grace of a mountain goat all the while looking for a trapped or hidden human being. This type of work is often done on the fly, at the drop of the hat, with little advanced warning. It requires a talented dog and a special handler willing to invest the time and effort. Your dog must have a HIGH level of ball/play drive. You want a dog that is focused and intense about playing. The best way I’ve ever heard this described is that you want a dog that will play ball or toys with anyone, anywhere, for any length of time without becoming distracted. This demonstrates a dog that has such a high level of focus and desire for his toy that he will eagerly work in difficult conditions for hours on end simply for his toy. 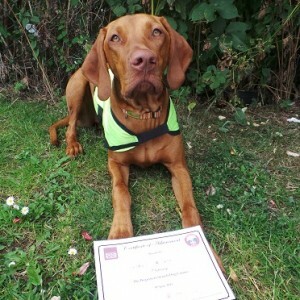 After doing ‘Puppy and Tricks’ class with my Vizsla pup I thought it would be both fun and interesting to join the Search & Rescue for Begginers course. 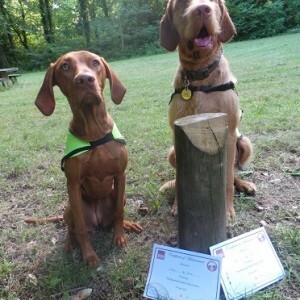 The course is held at my dog training club, is 3 months long with a class every other week. The training takes part in the woods near to my training club and is a joint operation with our local ALSAR team. We have a group of 8 dogs, in all shapes and sizes from standard poodle, cockerpoo to HWV. Spice was the youngest at about 6 months old. The training is all reward based with plenty of very tasty treats and lots of encouragement. It is also important that the course members carry out lots of practice during the week. 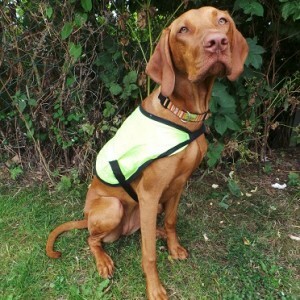 The aim of the course is to teach your dog to search for human scent in the air and not on the ground. The dog runs into the wind and into the human smell. You start by teaching the dog to run towards a person they see run away and hide, making sure at first that they are not too far away from them. They run to them and get given lots of yummy treats. Bit by bit you make this a little harder but always with plenty of rewards, basically making it the best game ever! It is essential that you always check the wind direction so that the dog can pick up the smell. There is lots of practice involved during the week, and time spent hiding friends and colleagues behind trees, in hedges and in long grass – so you will need a few willing volunteers! The dogs really do seem to love it, and all get very excited when it’s their time to search. It’s amazing how quickly they seem to pick it up. The Beginners course is all about teaching them to find the missing person. You then move on to the Intermediate course. Here you teach the dog to run back to the handler and give some type of alert and show the handler where the missing person is. If you pass the 2nd course and you’re accepted, you can move onto becoming part of the search and rescue team. This does involve weekly practice and call outs. You start off as a technician and move on up to trainee search dog handler. Both Spice and I have loved doing this training and I’ve watched Spice grow in confidence whilst giving her mental and physical stimulation. The sense of pride I feel when I watch her understand what is required of her, then carry it out, is tremendous. I really would recommend this course to anyone – even if it’s just for some fun with your dog.